One of the two Italians abducted by Maoists, tourist Claudio Colangelo, was today released unharmed by ultras, 11 days after being taken hostage in Kandhamal district, while his compatriot was still in captivity. A visibly relieved 61-year-old Colangelo, who was handed over to a group of media personnel by the Maoists, told reporters, "it was frightening". The SAD core committee today moved towards getting former Chief Minister Beant Singh�s assassin Balwant Singh Rajoana�s death sentence commuted to life. It directed the Shiromani Gurdwara Parbandhak Committee to file a clemency appeal before the President immediately. President Pratibha Patil's foreign trips has cost the public exchequer a whopping Rs 205 crore on her foreign visits, surpassing the record of all her predecessors. 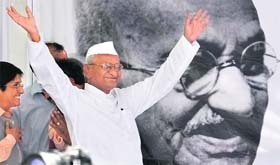 Since assuming office as the country's first woman President in July 2007, Patil has undertaken 12 foreign trips covering 22 countries across four continents. Seeking to expand their strategic ties, India and South Korea today agreed to step up political and security cooperation, as they vowed to double the bilateral trade to an ambitious $40 billion by 2015. 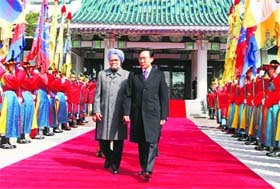 "We agreed to expand our political and security cooperation," Prime Minister Manmohan Singh said after his talks with President Lee Myung-bak here. Amid Indian IT firms' concerns over restrictive US visa policies for their employees, a top American senator has assured that he is working on a bipartisan bill that will reform immigration laws and allow more Indians to come to America. For many years, Altaf Mir (50) has stuck to a daily routine. He walks down to the banks of the Jhelum near Muzaffarabad in Pakistan occupied Kashmir (PoK) and stands there gazing at the gushing waters of the river. �The water brings with it the fragrance of my motherland, Anantnag, where I was born,� he says, pointing towards the Indian side of Kashmir. His misty eyes have just one dream in them - to travel to his homeland. 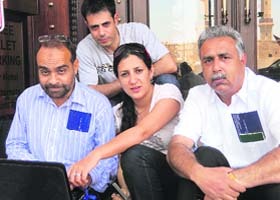 Mohd Urfi (L), a Pakistani journalist, and Pawan Bali, a Jammu-based woman scribe, with their team.